Don't Try This One - Looks a LOT better than it tasted. Living in a small rural Alaskan town in the winter limits dining out options. You improve your culinary skills or become satisfied with canned chili and spam. Sometimes, the choices of what you can make for dinner are severely limited, depending on when the last shipment of food arrived on the barge. When you find an unusual meat (that is different than beef, chicken or fish) in the store, it’s a good bet that most folks in town will be experimenting. Last week I found lamb chops. I made a Taziki sauce for the lamb. 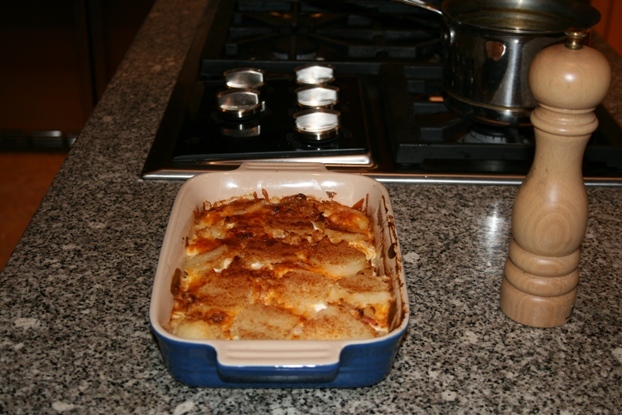 Found a recipe for this potato dish (looked similar to one I had had at a greek restaurant a few years back in Boston). Didn’t remember the feta cheese and there are no greek olives in town so we skipped the Greek salad. I could’ve made baklava since I did have filo dough – but we all figured we ate enough with what we had. It was a fair attempt for Alaska in winter. I gave the final output of the dinner a B grade. Jean, gave it an A, teenager, an A. But the prep of the dinner got an A+ – it smelled great cooking, we had a great time preparing it all, and it all came together very nice. The lamb was a bit fatty and the potatoes just lacked that Greek pizazz that I remembered from the Greek restaurant. The taziki sauce was awesome. It got me thinking, how often have I executed a project with precision perfection, only to be only so so satisfied with the final outcome? Do we need some challenges, some twists and turns, to make a project more fun so that we savor the outcome when we miraculously pull it off? What happens in life when you get everything you want and everything always goes your way? Isn’t the whole game one of relative experiences – kind of like a battery – with negative and positive things adding up overall to far more of a charge? I like complexity and challenge. Yes living in rural Alaska in the winter provides that. So, the very fact that I could even find ingredients to conjur up a Greek dinner should be reason enough to give the dinner an A+. This entry was posted on Monday, November 17th, 2008 at 10:22 pm	and is filed under Tips for Project Management. You can follow any responses to this entry through the RSS 2.0 feed. Both comments and pings are currently closed.